In 2012, James, Michael and Eric decided to open a business together. After many discussions and meetings with other breweries, we knew brewing was the right business for us. We found this industry opens its arms and welcomes in fellow brewers. With that sense of community in mind, we set out to bring quality beer and smiles to our customers. After breaking out some older brew equipment and buying some new stuff, we brewed the first batch on May 4th, 2013. The aromas wafting off the brew kettle got us all excited. We started to think about what beers to make. How many? What’s the best name? You could feel the warmth through our veins and we knew we were destined for this business. Quickly, we graduated to a ten-gallon system; with a new mash tun, hot liquor tank and 15-gallon brew kettle. One Saturday in June, it all came together for us. The brown was brewed, followed by an IPA; it was one very long and rewarding day of brewing. Then the wait…was the beer going to be any good? In our brew process, we split our ten-gallon batches into two five-gallon fermenters so we’d have two very different variations to try. We added dry hops, different yeasts, and specialty ingredients trying to find the best combination of flavors. We brewed a light American Ale and then it all seemed to flow. The IPA took less time in the secondary, so it was our first taste. It was good, and with a little tweaking it was great. Then we tasted the brown, just needed a little more body… “We might be on to something.” One of the five-gallon batches of American Ale was near great from the start. Then the fun began…it was time to come up with a name and business concept. Falling back on our roots: the outdoors, camping, hiking, sitting by a fire and socializing with friends and family over a tasty beer, we came up with a name representing our vision for community and our love for the Minnesota outdoors. 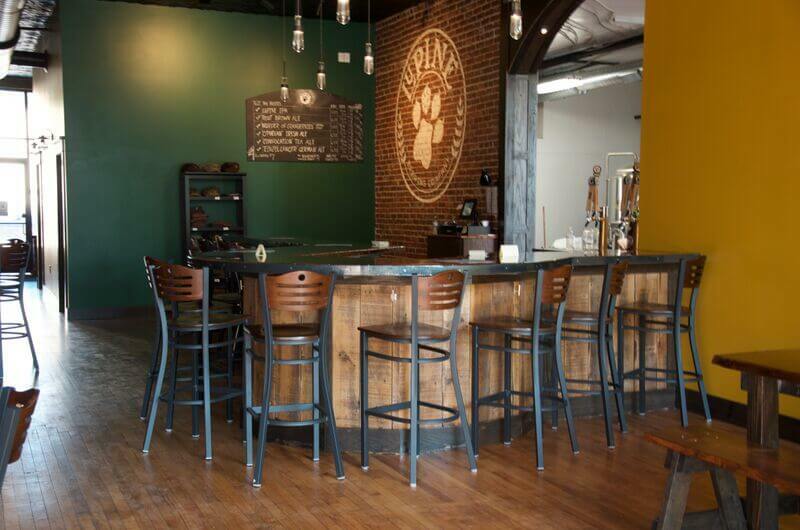 Lupine Brewing Company was born! The meaning of Lupine is “relating or pertaining to the wolf”; it brings together the native Minnesota heritage through the timber wolf with the natural community aspect of the wolf pack. 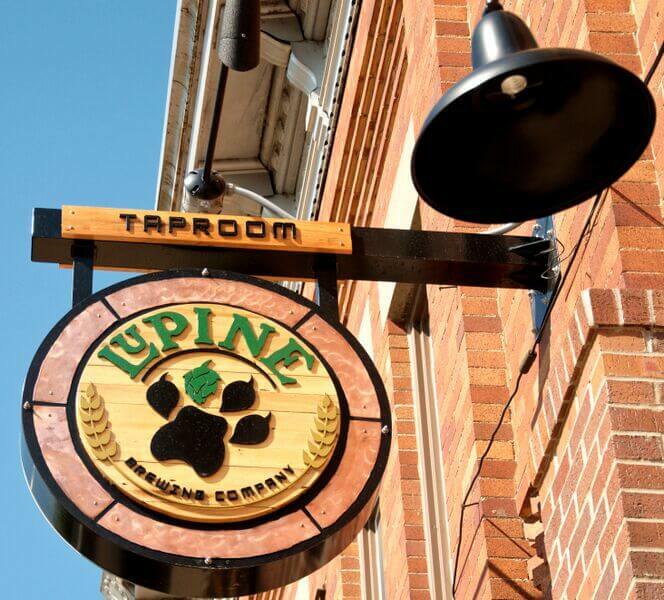 We would like to welcome you into the Lupine Brewing Company family, and would like you to be part of our Pack! With the business plan well underway, test brewing continued. Of course, there was more market research to be done, but it was time to start looking for a Head Brewer. After many interviews, we found the perfect fit. Grant Aldrich brings to us a passion for developing new flavors and extensive experience from a fellow brewery, and has been a wonderful addition to our team. Grant’s creativity and daringness to explore unique flavor combinations is going to be exciting! Then it was time to see what other people thought. We had friends over, LOTS of friends. “Damn, all these beers are good drinkable beers,” one of them said. The feedback got our morale up, but we still were striving for great. A mash tun paddle was carved, more equipment and kegs were bought, and a lot of hard work followed. After almost a year of trial and error, learning about all the processes, and perfecting our recipes, we developed several great beers. It was time to get serious. An existing facility in Saint Cloud had a ten-barrel system that hadn’t been used for years. A few weekends of elbow grease brought the kettle and vessels back to life…we were ready for the inspections. The summer of 2014 we brewed big scale. Stepping up from ten gallons to ten barrels was BIG. In late fall, we got our brewers notice and set out to reconnect with the bars we had spoken to about putting us on tap. One keg sold, then another, then 20. This is our future, the future of Lupine. In January of 2015 they bought a building built in the early 1900’s in the historic town of Delano, MN. They had to gut th e interior; replace the bricks in the front of the building, update the windows and were able to save the original floors and tin ceiling. They used the trusses from the old floor where the brew equipment is now to make the bar top and most of the tables. It turned out better than they had planned. They opened the taproom doors in Delano on August 8, 2015. The business will thrive and their sense of community through beer continues. Two guys with a dream of doing business together have been realized. Long-time friendships now turned into a business partnership striving for making great beer: Lupine Brewing Company!